This edition of the Dictionary, published eighteen years after its first appearance is an enlarged and improved version of it original corpus. During the past two decades, the Dictionary has achieved widespread acceptance and use. 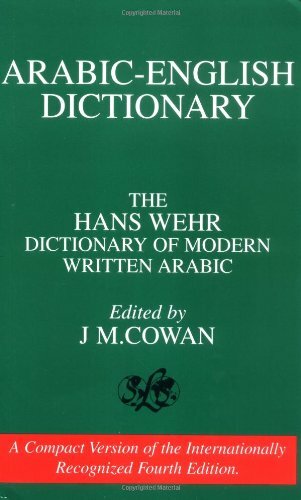 In the interim, modern written Arabic has continued to exhibit vigorous lexical growth. Therefore, feeling the need to fill in many gaps and update the corpus, the author again undertook systematic collection of material. In addition to many neologisms of recent origin, the author has incorporated much older material attested in present-day contexts, which had not yet appeared in the Dictionary, as well as numerous improvements and corrections. The result is this revised 4th edition has nearly 200 new pages. All new entries have been derived from primary sources, i.e. from running contexts. The source texts, predominately from the last ten years, cover a broad spectrum of content, style and origin, thereby providing a representative cross section of modern usage encountered in various fields such as technology, economics, sports, medicine, the oil industry and the natural sciences, as well as creative literature. Particular use was made of texts from Egypt, Syria, Lebanon and Saudi Arabia which were drawn from newspapers, periodicals, textbooks, official and private documents and belles-lettres; some use was also made of the press of the northwest African countries. The number of new entries, including lemmata as well as compounds, idiomatic phrases and new definitions of head words, runs to approximately 13,000. Moreover, in about 3,000 instances, smaller additions (new transcriptions, plural forms, prepositional government of verbs, cross-references, etc.) have been inserted, errors corrected, obsolete entries eliminated. Some lemmata have been completely reworked.